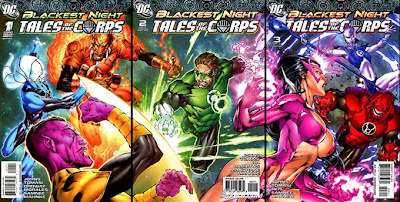 • PLOT SUMMARY: In this 3-issue miniseries, writers Geoff Johns and Peter J. Tomasi (Green Lantern Corps) reveal the secrets behind the Lanterns of Blackest Night! Bear witness to Blue Lantern Saint Walker's pilgrimage of hope, Star Sapphire Carol Ferris' sacrifice for love, Green Lantern Kilowog's courageous beginnings, Red Lantern Vice's source of rage, Orange Lantern Blume's bizarre creation, and the first appearance of the mysterious Indigo, leader of the Indigo Tribe! Written by Geoff Johns and Peter J. Tomasi. Art by Jerry Ordway, Chris Samnee, Rags Morales & Doug Mahnke. Cover art by Ed Benes.